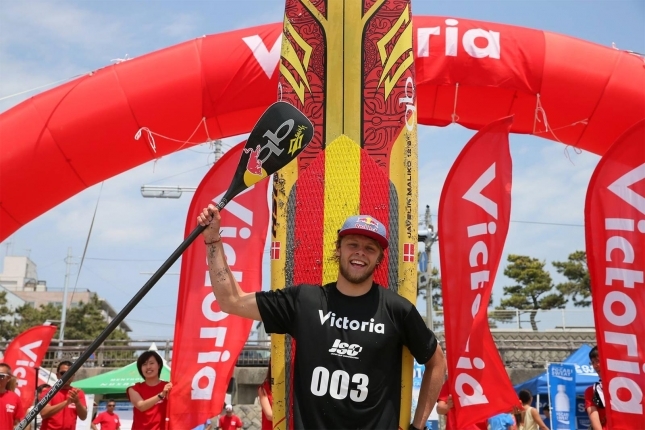 In brief: Casper Steinfath and Angie Jackson have taken out the sprint races on day two of the 4-star Victoria Cup in Japan, and in doing so have claimed the overall event titles ahead of an all-star field. Casper, third in yesterday’s distance race, channeled his inner viking to produce raw, explosive speed around the short course and salute ahead of Kai Lenny, Mo Freitas, Jake Jensen, Connor Baxter and James Casey in the final. With the distance and sprint races combined, the top five becomes Casper, Connor, Kai, Jake and Arthur Arutkin. Though even just making the top 15 was an achievement at this event, with the Victoria Cup producing the second highest level of elite competition we’ve seen so far in season 2016 (behind only the major Carolina Cup). While there were strong performances from established names and newcomers right down the leaderboard, it was Casper’s day. For the Naish/Quickblade/Red Bull team rider, this will surely be one of the most memorable wins of the his career so far — no doubt the Victoria Cup trophy will go straight up on the wall back home in Denmark alongside Casper’s two gold medals from the ISA Worlds. 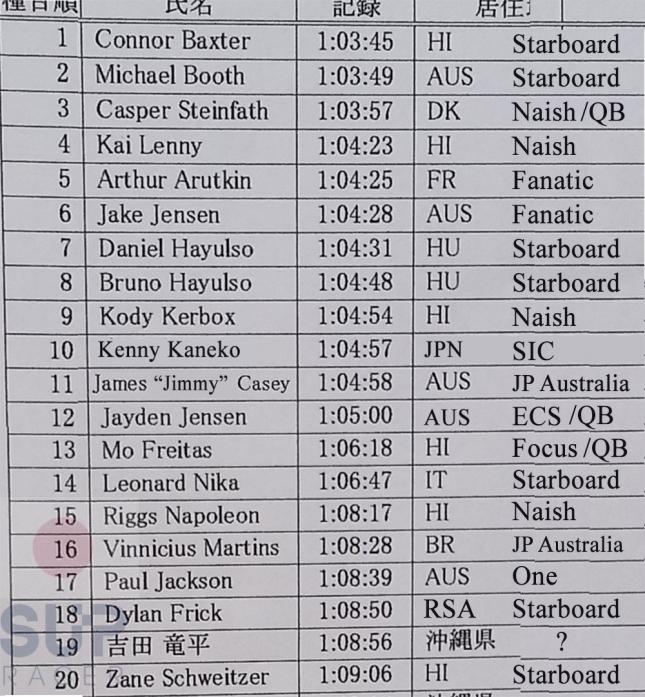 Interestingly, and somewhat surprisingly, this is the first time Casper has defeated both of his key rivals (and good friends) Connor Baxter and Kai Lenny in an overall event such as this. However to anyone that has followed the rise of this very well-respected young athlete over the past few years, Casper’s performance today comes as no surprise and will surely signal the start of many more to come. Others to impress included the dark horses such as Aussie James Casey and the Hasulyo brothers from Hungary, Daniel and Bruno. Local boy Kenny Kaneko gave the home crowd reason to cheer by rounding out the overall top 10. Yesterday’s distance race hero, Aussie dark horse Michael Booth, crashed out of the sprint competition after an uncharacteristic fall at a critical moment, relegating him outside the overall top 10 and highlighting the fickle, unpredictable nature of the two-race event format. Though I’m certain that Boothy showed enough of his natural talent this weekend to make it clear he’ll be a genuine contender at every big race this season. It was also a strong reversal from Mo Freitas, who finished 13th yesterday but 3rd today, claiming 6th place overall in the process. In the women’s, Aussie world beater Angie Jackson reversed yesterday’s 1-2 result with young gun Fiona Wylde, while Candice Appleby once again had to settle for third. Angie clinched the overall title based on a time difference countback (frustratingly for Fiona, this is the second time she’s lost a close event win, having missed out on the 2015 Turtle Bay event title in similar circumstances). Today’s big win is definitely a just reward for the hard-working Angie, who probably trains harder than just about any other athlete in the sport. The well-liked Aussie is an always-smiling fixture on the international race scene, while her win gives the fledgling board brand “One” – owned by Angie and her husband Paul – a nice boost as well. Rather symbolically, the One race boards were actually designed in Japan not far from where the Victoria Cup was held. Aussie dark horse Kate Baker was strong again to seal 4th place overall, which should provide her with a good dose of encouragement to tackle more international events in the future. Japan’s national champion, Takayo Yokoyama, rounded out the top five. Scroll down to read the recap from yesterday’s distance race. Also take a look at the updated SUP Racer World Rankings, with Casper Steinfath climbing to #4 in the world following his heroics on the weekend. Connor Baxter and Fiona Wylde have taken out day one of the 4-star Victoria Cup in Japan, triumphing against a red hot field in the land of the rising sun. Connor showed us all yet again why he’s ranked number one in the world, holding back 20 world-class athletes over the hour-long race, which debuted Paul Jackson’s excellent Super Lap format on the international stage. But while Connor lived up to his status as the favourite, he was nearly edged out by Starboard team mate and our official dark horse selection for season 2016, Australia’s Michael Booth. Boothy was neck-and-neck with Connor the whole way and very nearly took the win. Look out for this guy at the big races this year — he’s an absolute machine. Following this weekend’s race in Japan, Boothy, Connor (and many more of the world’s best) head straight to Europe for the EuroTour headline events (St. Maxime, Lost Mills and Bilbao), where they’ll likely continue battling for the podium spots. The “Danish Viking” Casper Steinfath came home third today, just a few seconds behind the top two. Those three guys formed a breakaway group that made the most of the unique course — the Victoria Cup was the first time Jacko’s “Super Lap” innovation has been used, and from all reports it was a very popular format. Apart from Boothy, other “dark horse” athletes to stand up at Zushi Beach were the Hasulyo brothers, Daniel and Bruno from Hungary, who finished top 10 against one of the more competitive fields we’ve seen this year. For some context: Daniel finished just eight seconds behind superstar Kai Lenny, who was fourth. It was a tight finish all the way down the leaderboard, with just 37 seconds separating 4th to 12th as the flat, windless conditions made drafting a breeze. That meant the “Super Lap” became even more significant, with the ability to take a shortcut on any one lap the only real chance to break away from the packs. In the women’s race it was a huge performance from Fiona to claim victory against two very fast women in Angie Jackson (2nd) and Candice Appleby (3rd). Candice led early but Fiona and Angie made better use of the Super Lap, taking their “shortcut” a lap earlier than Candice and opening up an insurmountable lead in the process. The two paddled together til the closing stages, where Fiona sprinted away to win by 21 seconds. 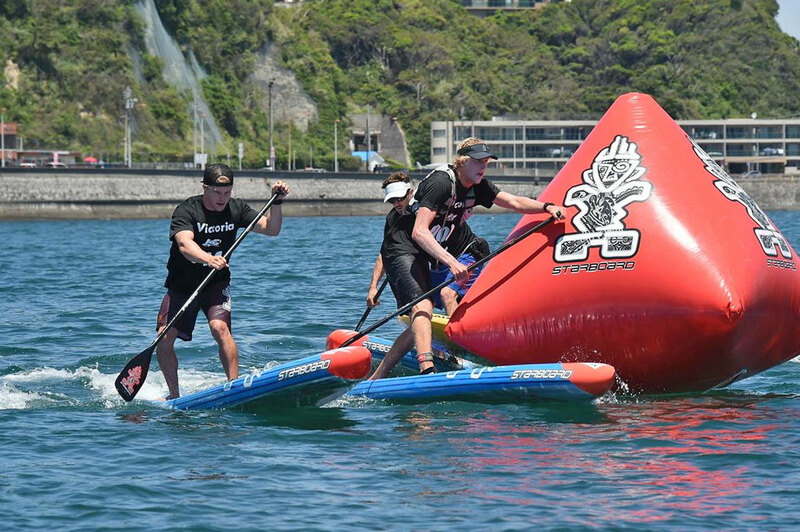 After Connor and Boothy went 1-2 in the men’s, Fiona’s win gave Team Starboard a clean sweep of day one, which perhaps comes as no surprise considering the blue boards are runaway leaders on our Battle of the Brands leaderboard. 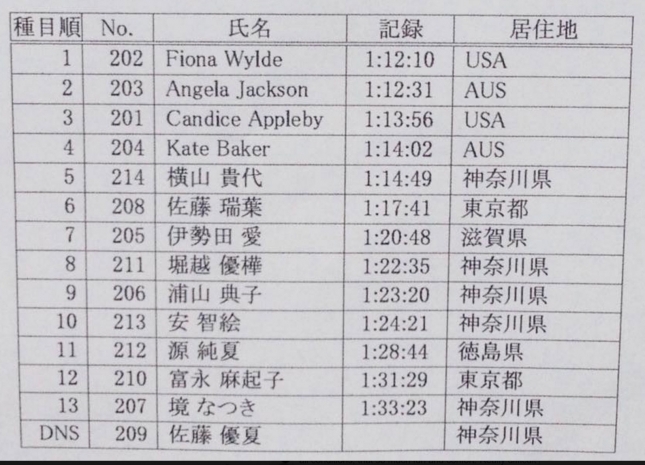 The dark horse woman of the day was Australia’s Kate Baker, who finished just six seconds behind world number two Candice. 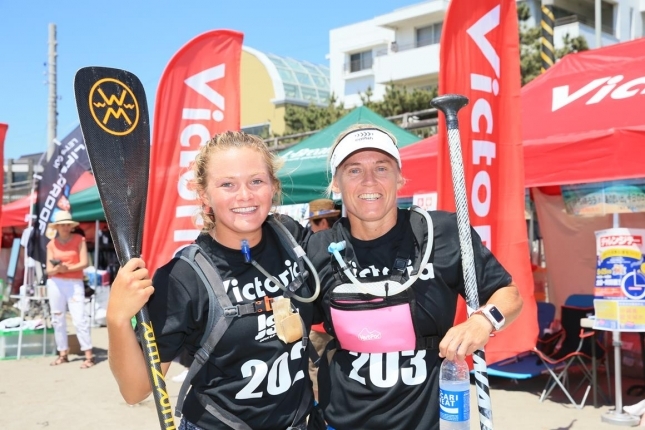 Kate is a newcomer to the international race scene, however she trains with Angie back home in Australia and will definitely be one to watch as her paddling matures. The Victoria Cup is a 4-star, 40% event on our “Race Index” system, meaning the event will play a strong role in the 2016 SUP Racer World Rankings. There are at least 40.00 points up for grabs for the overall event winners (based on the combined distance/sprint race results) — the Victoria Cup wraps up tomorrow, Saturday local time, with the sprint racing. 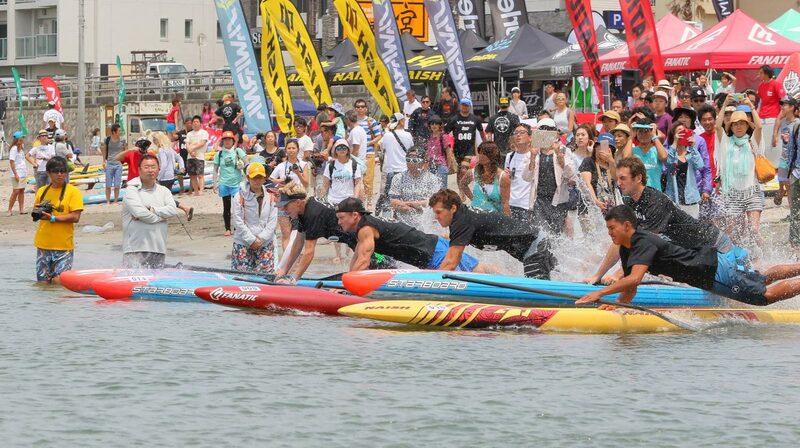 As we noted in our event preview earlier this week, Japan is on the verge of becoming a stand up paddle racing mecca. In addition to the Victoria Cup, the country will host a second international event later this year, the Japan Cup in September. There are dozens of other great local and regional events around the country, while Japan is also home to several world-class athletes, most notably Kenny Kaneko who finished top 10 in today’s race.